It has been a great few weeks at Moto Mountain Park. The trails are beautifully groomed and everything is in prime condition for a great summer. We want to thank not only our visitors, but the great group of people running the park. Thank you for all you do, whether you’re part of our team or a loyal rider! Summer plans got you stressed out? Summer plans may be on your mind if you have some free time during the next few months. Although it has been warm for the past few weeks and stays hot through August, most would consider June and July the main summer months. Even though the weather is right in August, school starting back up can make it hard to find time for fun if you have kids. Take advantage of the next couple of months by making summer plans that create memories that last well into fall and winter. One way to do that is to make a trip up to Moto Mountain Park. The great thing about Moto Mountain Park during the summer (and all year round) is that no matter what weather we’re experiencing, there is always something fun to do. Caught in the park during a downpour? Head over to Moto Bobs to wait out the storm while staying dry. Before you can even finish a plate of our delicious food the sun will most likely be back and drying out the trails – remember, this is Georgia weather we’re talking about. Summer plans don’t have to be complicated, which is why spending a weekend or a whole week with us is a great idea. 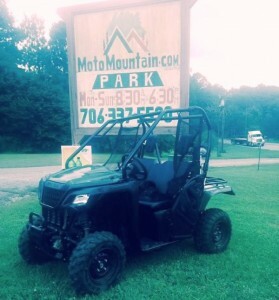 You can rent ATVs from us, so riding is as easy as paying the fees, strapping on safety equipment and hitting the trails. 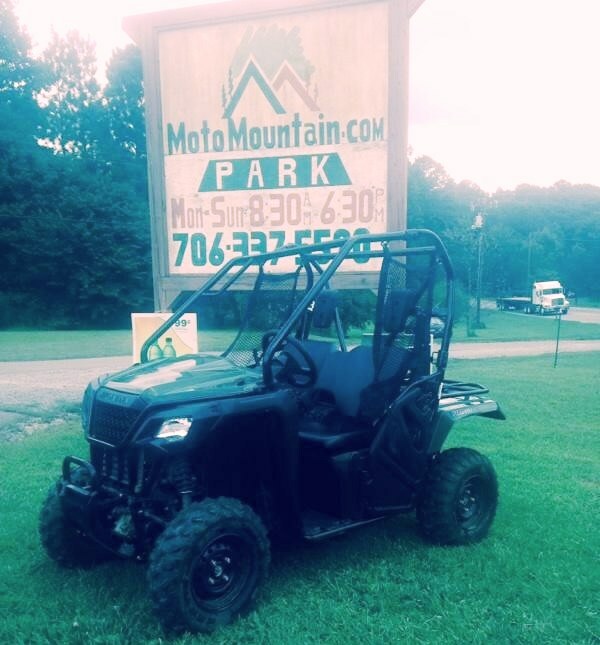 No need to worry about bringing an ATV with you, just call us for more information about our rentals and to make sure they’re ready for you! Summer plans are great to think about in advance, but if you suddenly just have the urge to hop in the car and head on over, we like the way you think. Sometimes spontaneous days can end up being the most fun. Let us be a part of your summer plans and come on up this weekend! The trails are ready, are you? 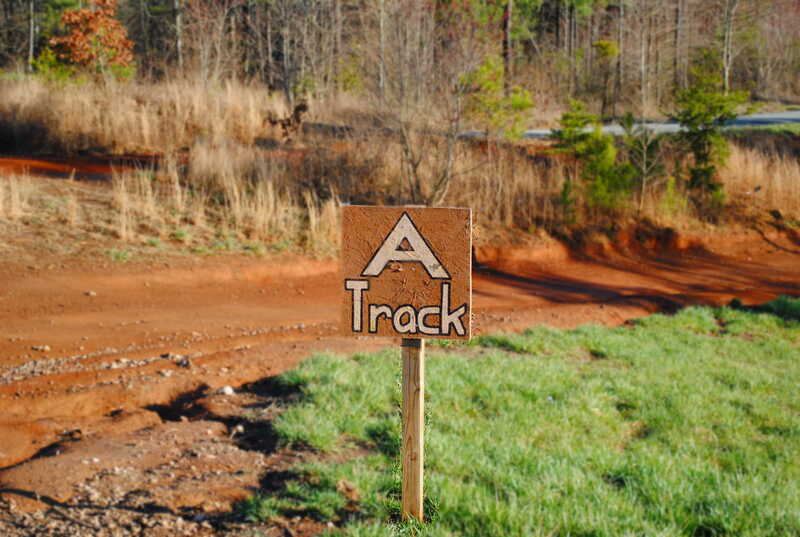 The trails are one of our biggest attractions here at Moto Mountain Park. Between our 41 miles of single track, 79 miles of combined trails and 14 miles of intermediate track there is no shortage of fun when it comes to trail riding. A day at Moto Mountain Park is only as good as the trails you are riding on. We work hard to maintain all of our trails. The A track has recently gotten some special attention and Tony spent several hours earlier in the week fixing the jumps and making sure they are in prime condition. The rest of the week was spent grooming the A track, so it is ready for a weekend full of fun! 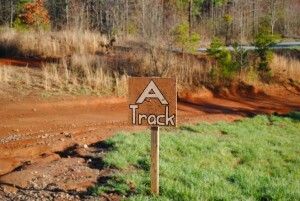 If you are new to the Moto Mountain Park scene you may be unsure which ATVs are good to go for our trails. MMP allows 4-wheelers, mountain bikes, dirt bikes and side-by-sides. Not sure if your ride is one you can bring up to Moto Mountain Park? Head over to our Facebook page where your questions can find answers. You can also give us a call at 706-337-5590 and ask the pros if your ride is good to go. With the recent grooming of the A track, let’s make this a Moto Mountain Park weekend. Bring your ride out our rent one of ours: no matter what your favorite type of ride is MMP is the perfect place to have some fun. Set aside some time (because after all there really is no time like the present) and spend all weekend at Moto Mountain Park taking advantage of not only the trails, but also the other exciting activities. Everything is ready to go on our end, now you just have to clear your schedule and come on by! Our paintball course in the works and will be up and running soon. The paintball course at Moto Mountain Park is moving along and will be here soon! You read that right: after waiting patiently (some longer than others if you have been wanting to see paintball come to Moto Mountain Park for a while) you will soon be able to have hours of paintball fun at your favorite riding spot. Just when you thought Moto Mountain Park couldn’t get any better, we are here to tell you that it certainly can – and soon. We love to spend some time outdoors and soak up the beauty of North Georgia as much as the next person. However, there are some days that just demand a little action and excitement. Luckily you don’t have to travel far to get just that. We’ve already brought you some of the best trails around, the mud bog and the zip line. If an action packed day sounds like it is right up your alley, the addition of our exciting paintball course makes it even easier to do it. 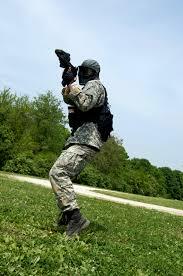 Never participated in paintball before? Let us paint you a little picture (pardon the pun). Imagine an adrenaline filled day with your closest friends battling it out to see who will be the champion. The protective gear only adds to the fun and kicks the intensity up a notch. You certainly won’t be bored if spending an afternoon on our paintball course is on your horizon. Like our Facebook page and regularly check out website for information about our upcoming paintball course. We will let everyone know more details as well as the opening date as soon as we have everything ready to go. We can’t wait to see you all up here for some crazy paintball fun. Birthday celebrations for CB were a great time at MMP! If you know someone in your life who could use a little birthday celebration, why not come one up to Moto Mountain Park. With plenty of outdoor picnic space, Moto Bob’s nearby and Sky Cabins for rent, MMP is the perfect spot to celebrate someone who enjoys spending time outside. And of course, if they are a lover of riding the trails, what could be better than being right where the action is? A birthday spent at Moto Mountain Park won’t be one the birthday boy or girl will soon forget. 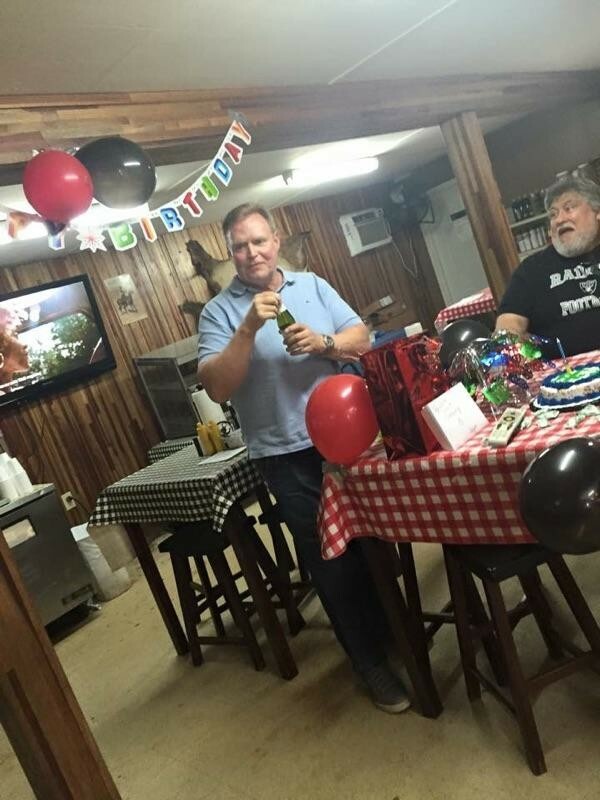 We would love to help you make a birthday celebration special, so give us a call at 706-337-5590 and let us know how we can make a great birthday celebration a reality. 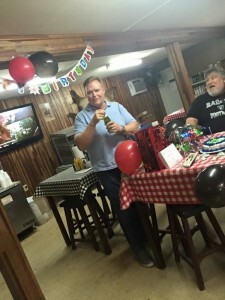 We love to make people feel special on their birthday and let them know how appreciated they are. Do the same for someone in your life by setting up a birthday celebration at Moto Mountain Park. And while you are at it, if you haven’t wished CB happy birthday yet, head on over to our Facebook page and give him a belated shout out. We hope to see you and your birthday loving crew soon for your next celebration! Do you have new ideas of things you’d like to see at MMP? make Moto Mountain Park great. However, some of our best ideas come from you, our faithful riders. We’ve been working on a few new ideas already, like bringing hunting and paintball to Moto Mountain Park. 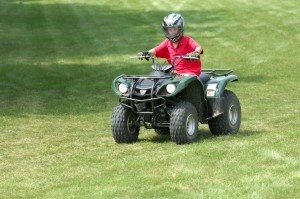 Although we are an ATV park we love to bring new and fun ideas around to help our riders have a great time. What are some of the ideas that you would like to see come to Moto Mountain Park in the future? Maybe you’ve got an idea for additions we could make to our trails, modifications to the Sky Cabins, or anything else under the sun that you think would make a great addition to MMP! Not sure how to share your new ideas? We love to hear from our riders, so head on over to our Facebook page and give it a like. Once you’ve like our page you can post on our wall about the things you’d like to see at Moto Mountain Park. You might even see someone has posted a similar idea and you can contribute anything you have to add. Don’t be shy, let us know what your new ideas are. New ideas are what keep things moving forward. We are very pleased about all the new things we have brought to Moto Mountain Park so far, but we always love to hear from riders about what they would like to see in the future. Don’t forget to like our Facebook page to let us know your ideas or if you have questions about the services we offer! Spring fun doesn’t have to be difficult to find. Spring fun may seem hard to find, especially if you don’t know where to look.If you’re planning activities for your family or a group of friends it can be hard to find something that everyone wants to do. The bigger the group the harder it can be. If you can manage to overcome the hurdle of finding something that the whole group wants to do for the weekend, the next challenge is making sure everyone has the right equipment. If your group has decided that a day at Moto Mountain Park is the way to go, there are plenty of ways to make sure everyone has a great time. Maybe you’ve got a few frequent riders in the group who own their own equipment, and a few that are new to the scene and may be without their own ride. This is certainly not an issue if you’re coming up to Moto Mountain Park for some spring fun. We offer rentals, which is perfect for those friends or family members who are wanting to ride the trails without the commitment of owning their own equipment. We also provide the equipment for everyone who is interested in taking advantage of riding the zip line. Another great way to have spring fun is to spend a few nights in our Sky Cabins. All your group has to bring is themselves, their luggage and anything else they want to make your stay even great. Let us do the work for you and make your stay great! Spring fun is easier than you think, especially if you are at Moto Mountain Park. Call us today at 706-337-5590 for more information about how we can help make this season a fun one for your family and friends! Rain means time for some mud bog action. Getting a little mud bog action at Moto Mountain Park is the perfect activity for this weekend. Between all the rain we have been having and the slowly-rising temperatures, there is sure to be some muddy fun had by all. We love it when riders come on up and have a great day out on the trails. That’s what we’re known for right? We take a lot of pride in our well-groomed trails, but there is more to Moto Mountain Park than just great trails. Our mud bog is one of the fun outdoor activities you can take part in if you’re looking to take a break from the trails this weekend, or even just mix it up a little bit. Although there is some rain on the forecast for this weekend, that isn’t stopping us from having a great time – and it shouldn’t stop you either! Moto Mountain Park is open every day rain or shine unless we announce otherwise. Take a walk on the wild side and brave the rain this weekend. Fresh rain means the perfect conditions for some mud bog action and getting down and dirty. And we all know kids just can’t resist some good mud when they see it, so bring the whole family for some muddy fun! 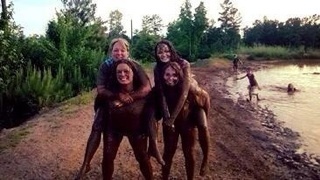 Some mud bog action is just one of the ways you can have a great time at Moto Mountain Park. If sitting inside and staying dry while it rains is your idea of a good weekend, look into renting one of our Sky Cabins with your friends. There doesn’t have to be a limit on the fun when you’re at MMP. Check out our Facebook page and let us know what your favorite way to have fun at MMP is. We’ll see you at the mud bog! The Moto Mountain Park App is now available for iOS! The Moto Mountain Park App being available for iOS (Apple iPhones) is just another way MMP is moving forward and offering you more services in the new year. Similar to the app release for Androids earlier in the year, this app will help you stay connected to us in more ways than ever before. Everything you need to know about Moto Mountain Park is now available at your fingertips. You can locate us, contact us, and even keep up with recent photos and videos – all in one place. Our weekly posts are a great way to keep up with new events or things going on at Moto Mountain Park. Now with the app, you can access the posts right from your iPhone to see what is going on at MMP. If you’re interested in booking a stay in one of our Sky Cabins, you can use the app to check out pictures of the cabins and see what all they can offer you during your stay. We like to be as available as possible to current and future riders. The contact information being available on the app for iPhones helps us be more available to everyone. If you have questions about anything, use the app to look up contact information and give us a call. We’d love to hear from you! Go to http://appsto.re/us/100u6.i to learn more about the app. We are really excited about the release of the app for iOS. We can’t wait to see how this helps us grow and connect with more riders. Come on up this weekend to enjoy some time one the trails or just enjoy being outside. See you soon! Weekend plans can be hard to come up with, especially if you are trying to plan something exciting for family or friends. Even if you are just looking for a solo activity this weekend, it can be hard to find just the right mix of down home fun and adventure. No matter how many people are involved in your weekend plans, it doesn’t have to be stressful. Come on up to Moto Mountain Park and you will find there is something for everyone in your group. If your bigger group of family or friends has a hard time agreeing on what to do that won’t be an issue if coming to Moto Mountain Park is your weekend plans. No matter what mix of people are in your group, there is something for everyone to do. 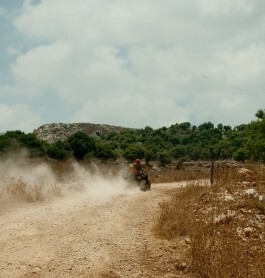 There are activities for the adventurer, like riding the trails. If a relaxing weekend enjoying the outdoors sounds good to anyone in your group, they can head to Moto Bobs, grab some lunch and sit outside. The mountains of North Georgia make for beautiful surroundings to enjoy and outdoor lunch. For all of our adventurers, please be aware when you are making plans that our zip lines are currently closed for inspections. They will reopen the second week of April. The safety of our visitors is extremely important to us and regular inspections help us ensure your safety. In the meantime, take a ride on our freshly groomed trails! We also will be having a sunrise service at 6:30 am at the pavilion. As far as weekend plans go, don’t get overwhelmed. No matter how many people you have in your group there is always something for everyone at Moto Mountain Park. We hope everyone has a great weekend and we can’t wait to see you out and about these next few days.